I’m one happy girl because, after just about six weeks apart, Michael is back! He arrived laaaate Monday night and is currently fighting off jet lag and readjusting to America. I’m just happy we’re on the same side of the world again. Before he got back, though, my baby sister celebrated a momentous occasion: college graduation! 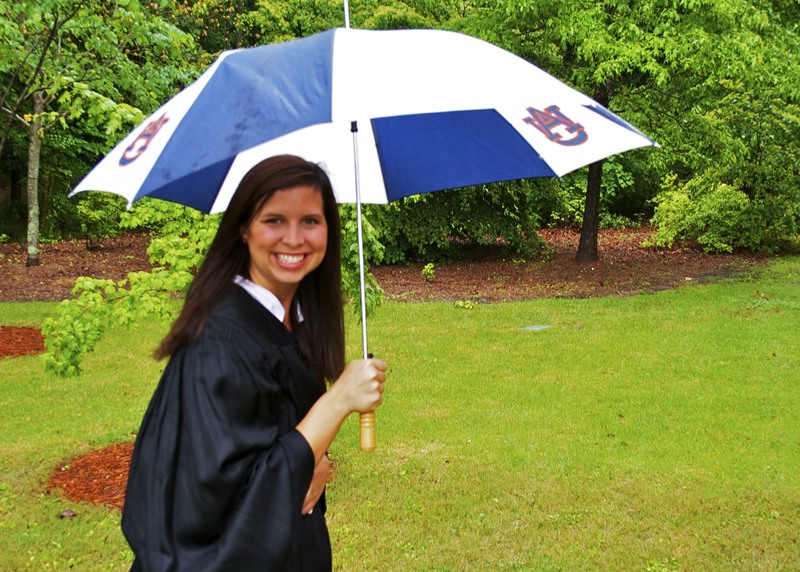 Helen is the last of the Farnsworth girls to graduate from Auburn, and I know my parents breathed a huge sigh of relief to be finished with tuition after 12 continuous years. Although truth be told, I think they were more than a little sad to realize their baby is really and truly grown up and off to the real world; she started a real job in Nashville on Monday. It was a cold and nasty day (high of 53 degrees in an Alabama May! 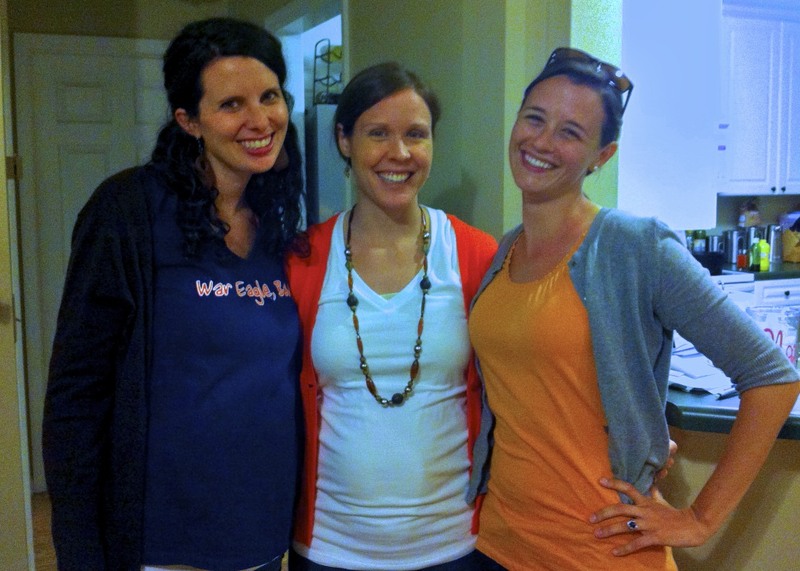 ), but we had fun celebrating little Hel-Hel. So proud of her! Not even halfway through the morning, and I was already teary-eyed, several times over: at a quick e-mail from Michael, flowers from my parents, a certain hymn, and yes, even a video of a commercial I saw posted on Facebook. It’s Mother’s Day, and my heart is overflowing with gratitude. I’m thankful, of course, for my own wonderful mother, and the love and practical wisdom and service she’s given me all these nearly 30 years of my life. But I’m also beyond thankful for the privilege of, Lord-willing, getting to be a mother myself, oh so very soon. Today, I can feel the little one kicking, and my heart (and perhaps my eyes!) overflow. This day can, of course, be hard for so many. Last year, those feelings of sadness came laden with guilt: shouldn’t I just be grateful for my own mom? Why must my emotions zero in on what I didn’t have? Why was it so hard to even look friends with children in the eye? This year, I feel hope and joy and anticipation, but sadness, too. Sorrow, for my friends who are waiting with empty arms, and no red-circled calendar dates on the horizon. Grief, for the silent pain this day can bring to many, so often unacknowledged. Sadness, because while my obvious pregnancy makes this in some ways my first Mother’s Day, there are little ones I’ve never known who will never have a future and will never call me mom. It’s a complex mixture of joy and longing that swirl in my heart this evening. Computer in my lap, my feet are propped on the coffee table before me, thanks to burgeoning varicose veins brought on by this pregnancy. While I hate those nasty veins and the awful, constricting tights I now wear because of them, I don’t know if I’ve ever been more thankful for anything. This physical marker, ugly as it may be, means hope. It speaks of life, surging and strong. And so it is with our sorrows. Ugly and unmanageable, yet he can use them to point us to hope: hope outside of us and beyond the feelings ruling our hearts. Hope that, though weeping may endure for the night, joy comes in the morning. That no matter what that joy looks like (the kind we wish for or the kind we’ve never even imagined), it really is his best for us. I’m glad today. Yes, my little girl’s kicks make that easier, unspeakably simpler, than last year. But I’m most glad because, no matter which way my stubborn heart goes, he holds on. His love is better than any mother’s. My baby sister is graduating from college today: what on earth happened to all the years?!?! It doesn’t seem possible that it has been eight years (!!!) since I graduated from Auburn, but there they are, the dates staring at me bold as brass from my calendar. We’ll head down to Auburn for Helen’s celebration in just a few hours, but this actually won’t be my first trip this spring. Two weeks ago, I drove down to meet some friends and see Helen for the A-Day game and the last rolling of the Toomer’s Oaks before they had to cut them down (thanks a lot, Harvey). 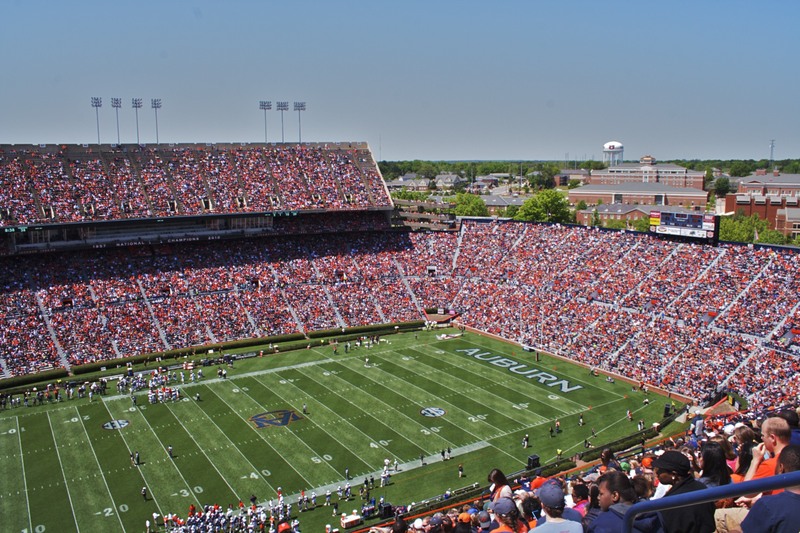 It was so fun to reunite with a few friends from college–to catch up on their lives, to meet my friend’s precious son, and just to be back in the loveliest village on the Plains. Here are a few photos from my day. The football game: 83,000-strong! The crowd atmosphere was much more like attending a fall football game than a spring training scrimmage, and the day was perfect with blue skies and cool breezes. My friend Michelle and I at the game. Our friend Aimee, who lives in Auburn, had to go home to put her little one down for a nap but her husband came to the game and (incidentally) acted as our photographer. Post-game, we and the other 80,000 fans slowly, slowly, slowly crawled our way to Toomer’s Corner for the after party. I didn’t bring any toilet paper, but I did run into another friend’s grandparents, who gave me a roll. At least our little girl got to roll Toomer’s once, right? 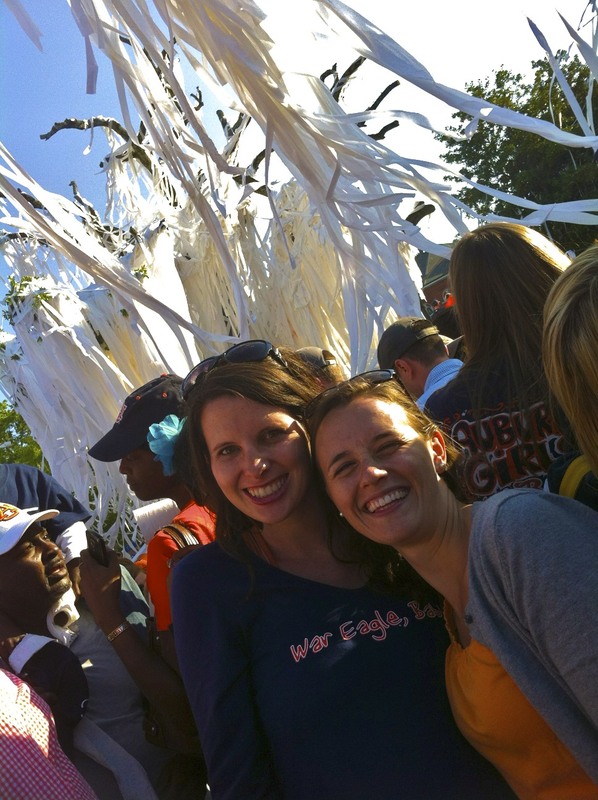 It was complete madness at Toomer’s, y’all. So crowded that you could hardly take a step once you got closer to the trees… we just shuffled along as the crowd pushed. Aimee and Wyatt tried to come with us, but they were loaded down with a stroller and decided to turn around… it was not exactly conducive to maneuvering around with a little one. After we left the chaos at Toomer’s, Michelle and I met back up with Helen and we all headed over to Aimee’s house for an awesome dinner. I’m thankful for old friends and so glad I was able to head back to Auburn for fun hangout time and–of course–to get in one more roll. Rest in peace, Toomer’s.